TWO Cuestars championship trophies will be on show in High Wycombe’s Liberal Club. 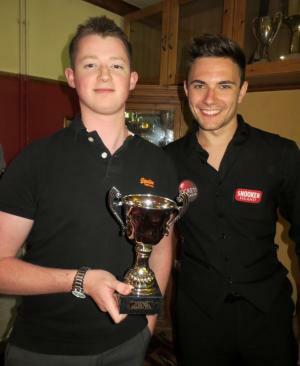 Following Sonnie O’Sullivan’s success in the Gold Tour championship, Ryan Gavin claimed the Six-Reds title. The 20-year-old prevailed 2-1 in the final against Joshua Lee, who was playing on home tables at Jesters Snooker Hall, Swindon. Gavin, who lost 2-0 to O’Sullivan in last season’s Silver Tour final, finished 14th in his debut season on the Gold Tour. He entered three of the eight legs but has yet to progress from the group stages at the higher level. Earlier in the day, Gavin was beaten 3-1 by rankings winner Thomas Lancastle (Eastville SC, Bristol) in the last-16 of the Gold Tour championship. LAST-16: Karl Eggar (Stoke SC, Gosport) beat O Heath, Joshua Lee (Jesters, Swindon) beat Jordan Lee (Woking SC), Bradley Cowdroy (Greenbaize, Bournemouth) beat Ben Hatch (Eastleigh), Edward James (Woking SC) beat Joe Kitchen (Stoke SC, Gosport), Ryan Gavin (Liberal Club, High Wycombe) beat Ben Tillison (Copnor SC, Portsmouth), Stewart Ball (Greenbaize, Bournemouth) beat Jasmine Bolsover (Woking SC), Canberk Benning (147 SC, Swindon) beat Lewis Parnham (SWSA, Gloucester). Bye: Daniel Compton (Copnor SC, Portsmouth). QUARTER-FINALS: Lee beat Eggar, Cowdroy beat Compton, Gavin beat James, Benning beat Ball. SEMI-FINALS: Lee beat Cowdroy, Gavin beat Benning. FINAL: Gavin beat Lee 2-1. Picture by Tim Dunkley: Ryan Gavin (left) receives his trophy from top amateur and special guest Ben Harrison.